Hampstead Heath has been a playground for Londoners for more than one hundred years. 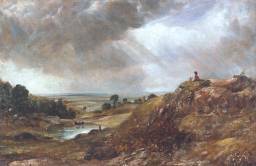 When Constable painted it in the 1820s, it was still windswept high heathland to the north of the great metropolis of London. However, the incursions of speculative builders and the extraction of sand for the construction of the new railways changed its face irretrievably during the nineteenth century. Early conservators fought back to retain the essential wild character of the Heath for posterity. Today the future of the Heath is under new threats from the twin onslaughts of time and usage, while the Corporation of London, which has owned the Heath since 1989, faces escalating costs in managing this historic landscape. In 1865 the Open Spaces Society (OSS), Britain's oldest national conservation body, was established to preserve our commons for the enjoyment of the public. Founder members included John Stuart Mill, Lord Eversley, Sir Robert Hunter and Miss Octavia Hill. One of the Open Space Society's first success stories was at Hampstead Heath, four miles north of central London. Despite objections, excavation continued in earnest. In the 1860s Sir Thomas Maryon-Wilson, then owner of the rights of Lord of the Manor, sold a quarter acre of sand and ballast in strips along Spaniards Road on the Heath to the Midland Railway Co. The company, which could not obtain materials from farther afield until it had completed its tunnels, paid a stiff price for the rights and maximised its use of them: in places it delved 25ft. deep. This looming destruction of the Heath inspired the formation of the OSS, whose members campaigned to prevent further despoliation and development of the Heath and to bring it into public ownership. By the early nineteenth century Hampstead Heath was already popular as a day out for Londoners and its popularity increased after the opening of Hampstead Heath station in 1860. Sir Thomas Maryon Wilson assigned a large site for a fairground in 1865 and by the 1870s, there might be as many as 30,000 visitors at the August bank holiday and 50,000 on a fine Whit Monday. Such large numbers caused damage to the Heath, particularly fires among the furze. A series of court cases over the future of the Heath only ended with the death of Sir Thomas in 1869. Finally the Metropolitan Board of Works (MBW) purchased the original 220 acres of heath from his successor and the Hampstead Heath Act 1871 was passed. The Act included a clause: "The Board shall at all times preserve, as far as may be, the natural aspect and state of the Heath." The MBW adhered to this objective and repaired earlier damage caused by sand excavation on either side of Spaniards Road across the Heath. The appearance of the heath continued to excite concern - the early benefactors wanted to maintain the moorland character of the old heath. It was acknowledged some landscaping was needed, if only to rectify the sand diggings which had made much of the ground 'one collection of dangerous and unsightly pits'. However. in many areas the soil brought in to replace that lost sustained a different type of vegetation to that replaced, changing the character of the Heath. In the 1870s formal municipal parks were coming into vogue but Philip LeBreton, chairman of the MBW's Parks Committee, favoured the restoration of the natural appearance of the heath and this met his colleagues' desire to economize. By 1875, with the scars of excavation largely grown over, the MBW was winning praise for a judicious neglect which had not made the heath 'prim or park-like'. In 1889 the London County Council (LCC) was formed and took over the Heath, reviving fears that it might be turned into a municipal park. Local alarm at this prospect led to formation of the Hampstead Heath Protection Society in 1897, with the objective of "the preservation of the original Heath in its wild and natural state and also the preservation of the natural characteristic features of later additions to the Heath so far as is consistent with their full enjoyment by the public." Additional land was added to the Heath during the late nineteenth and early twentieth centuries due to the generosity of a number of benefactors. In 1972 the London County Council (LCC) was replaced by the Greater London Council (GLC). Amid renewed concern among Hampstead residents that the new authority might wish to tame the heathland, in 1978 an action group was formed to reinvigorate the Heath and Old Hampstead Protection Society. This evolved into the present Heath and Hampstead Society (HHS). When the GLC was abolished in the 1980s Hampstead Heath was transferred to the London Residuary Body and in 1989 the Corporation of London assumed ownership of Hampstead Heath from the LRB.